Heat oven to 375°F. Separate dough into 12 strips. Place flat on ungreased cookie sheet; do not twist. With sharp knife or kitchen scissors, cut 2 small triangles from one end of each dough strip to form a point that resembles a fingertip. * Lightly score breadsticks in center to resemble knuckles. Cut each pepperoni slice into 2 pointed ovals to resemble 2 fingernails. Place 1 pepperoni piece on each breadstick. Bake at 375°F. for 13 to 15 minutes or until golden brown. If necessary, reapply "fingernails" with small dot of ketchup. Split each breadstick. 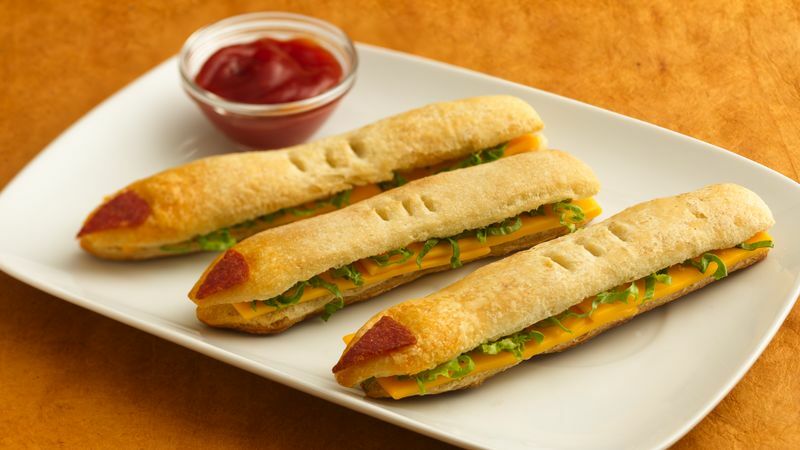 Cut each cheese slice into strips and place in breadstick, overlapping strips. Top each with lettuce. If desired, serve with mustard, mayonnaise or ketchup. Serve warm or cold. *Place small triangular dough pieces on cookie sheet; bake until crisp. Use as croutons or nibblers.